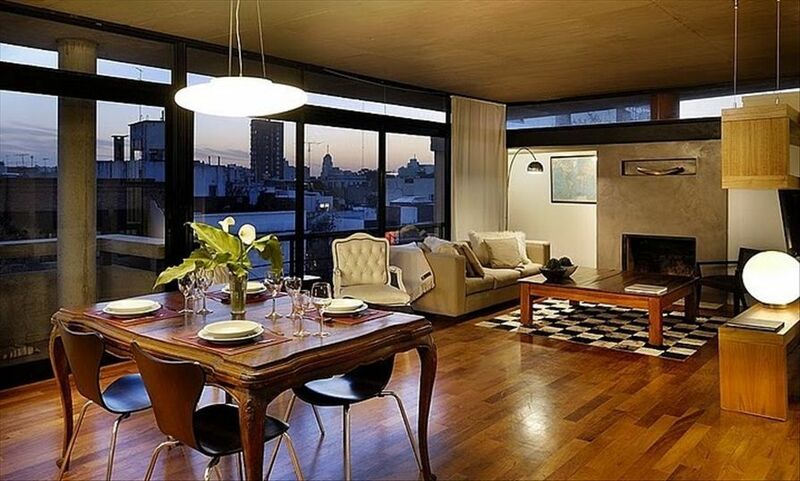 With dreamy views overlooking cobblestoned streets, this beautiful, 2-bedroom, 2-bathroom penthouse is the ideal base for short or long stays in Buenos Aires. Situated in the heart of Palermo Soho between Plaza Serrano and Plaza Armenia, the location simply could not be better! The apartment complex is an architectural landmark that combines convenience, style and wonderful open spaces. Surrounded by boutiques and cafés, it reclines on a leafy street and is designed to let light pour in from every direction. A central court provides elevator access to the apartment. Further back, a tranquil garden and in-ground swimming pool rest behind ivy-covered walls. A live-in doorman provides excellent building security. The penthouse is very bright and comfortable. Floor-to-ceiling windows let in an abundance of natural light and fresh air. The decor features antique, rustic and modern furnishings that are representative of Argentina and several paintings by a local artist. Surfaces are finished in clean, natural materials. The apartment covers over 1000 sq. ft (100 sq. m). Two en-suite bedrooms are situated on opposite ends to give privacy. In between you will find living, dining, and study areas, an open-plan kitchen, access to a covered balcony and an interior stairwell to the private terrace. It is the perfect floor plan for families with children, couples travelling together and anyone who loves socializing. As a testament to its comfort and functionality, the apartment is often rented for weeks at a time and has several repeat guests who consider it their ‘home-away-from-home’. The living room features a spacious sofa, HDTV with extensive cable package (BBC, CNN, Fox etc.) and a wood-burning fireplace. The dining table has seating for six and a wonderful view. The study area includes a 3-metre work desk and berths for two people, a printer, fax, local phone and Vonage international phones. The international phone has a +1 country code that allows incoming and outgoing calls as if you were located in North America. The master bedroom includes a King bed with the same mattress set used in top hotels, a HDTV, sheer and blackout curtains and silent hot/ cold air conditioning. Its bathroom has plenty of counter space, a cupboard, toilet, bidet and standard bath/ shower. The second bedroom has two separate Twin beds that can be configured as a Queen with deluxe pillowtop cover. Its bathroom features a toilet and sumptuous marble shower with rainhead and skylight. A baby cot is available upon request. The kitchen is equipped with gas and electric stove, a convection oven, microwave and has numerous appliances tucked away. High quality stainless steel pots and pans will please the travelling chef, and a Nespresso coffee machine will keep all coffee lovers happy. This apartment is often rented for its impeccable location; however, its pièce de résistance is the private rooftop terrace that provides stunning panoramic views of the Palermo Soho skyline. It is perfect for sunbathing, crowd gazing and has a large charcoal parrilla (grill) for preparing a traditional asado (BBQ). What more could you want? Whether your aim is to explore innumerable local boutiques, dine under the stars or sky, trace the footsteps of the barrio's literary past, or simply to relax and get away from it all, this gorgeous apartment will provide you with both the perfect starting point and final destination! Keywords: Apartment, condo, penthouse, loft, home, private residence, terrace, pool, BBQ, doorman, best location, secure, high-end, professional, fully managed. Originally from South Africa, I currently live and work in Canada. I love to travel, especially to hot and dusty places. I am constantly upgrading the apartment with a view to making every stay a wonderful and unforgettable experience. • Charming neighbourhood + unbeatable location + exclusive private terrace • Away from highrises, traffic chaos and inner city noise • Filled with natural light and fresh air • Safe, well-lit and super-convenient • Accessed by wide alleyways and side walks • Close to parks, arts, entertainment • Easy access to the down-town. Situated on a quiet street midway between two plazas where you will find many cafés, bistros, arts + crafts stalls, and a children's playground with swings, a carousel and a sandpit. Local landline includes both voice and fax capability (send and receive). There is no dryer, but a clothes rack is located on the terrace. In the summertime, clothes dry very quickly in the fresh air. In the wintertime, the rack can be used inside. There is a large indoor parking garage with 24 hr security one block away that features access for tall vehicles. + private stairwell to rooftop terrace. Includes professional stainless steel kitchenware, Nespresso machine, great light and view. 2 HDTV flat screens (living room and master bedroom). Premium cable package in both main bedroom and living room. Living room has additional digital channels including BBC, Fox News and other English channels. iPhone/ iPod dock (30-pin connector). Coffee table books on Argentina and Canada. Chess, checkers, cards and assorted games. Hidden garden in building courtyard with inground pool and security gate. Main level, covered, table & chairs for two. Private terrace with BBQ, mood lighting, sunbeds, chair and table set for four. Unheated seasonal (summertime) pool in garden located within the apartment complex. Two safes (one in each bedroom). Information on concierge services is provide in the apartment guide that will be mailed to all guests on confirmation of booking. Airport transfers can be arranged by the property manager prior to arrival.